If you haven’t read this yet, you simply must. It is so good and funny, warm and sad, bittersweet and wonderful. I’m reading it slowly, so that it will last. The book centers around Junior, a teenager and budding cartoonist living on the Spokane Indian reservation. When he leaves the rez to attend an all-white school, he’s seen as a traitor to his people. It’s a powerful story, written in a breezy and likable voice. “So I draw because I feel like it might be my only real chance to escape the reservation. And the cartoons included in The Absolutely True Story of a Part-time Indian, are lifeboats. They lift up the text, elevate it from a really good book to that rare find–really great book. By adding another voice, another layer, they offer a deeper, more honest perspective. 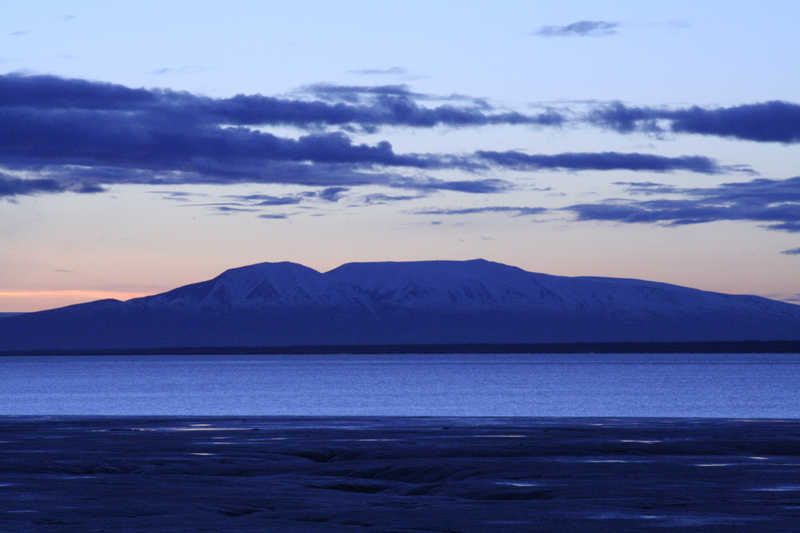 We took an evening beach walk a few nights ago to watch the sunset, just before 10 p.m. I can’t get enough of the twilight blues (by the end of this summer, you will probably all be tired of looking at the twilight blues, lol). The variation of shades, as the light shifts, is so lovely and ghostly. It’s like nothing I’ve ever seen. Sometimes I’m sure that it’s what keeps me here in Alaska. P.S. We are up to fifteen and a half hours of daylight and still gaining over five minutes at day. It’s really kind of glorious. P.S.S. 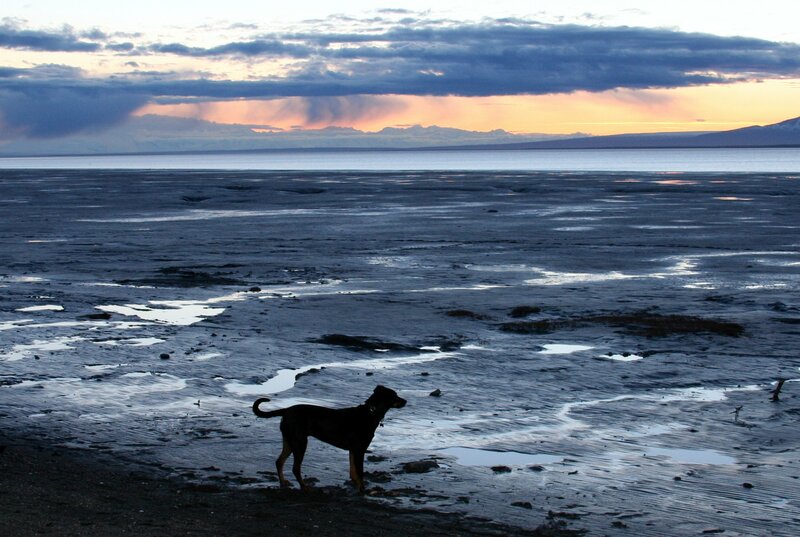 The stretch of beach where Seriously is standing is part of the mudflats. These are gooey areas that reveal themselves when the tide is low. They look like gray mud and can be slippery. They also occasionally act as quicksand. People have become stuck and years ago a woman (on her honeymoon, no less) became caught out along Turnagain Arm and drowned when the tide came in. 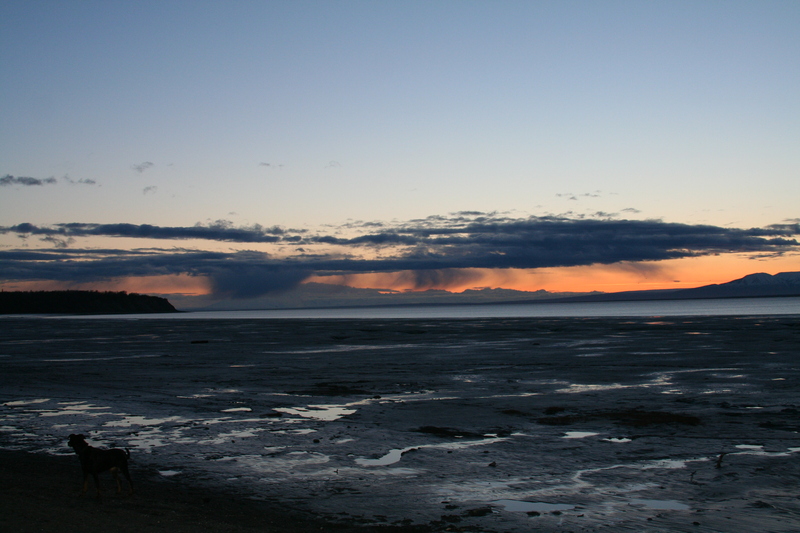 More recently, about three years ago, a big and strapping military dude drowned when he got caught on the mudflats while walking back from Fire Island (here in Anchorage, the tides rise fast, and are powerful and deep.) His body later washed up on the beach. 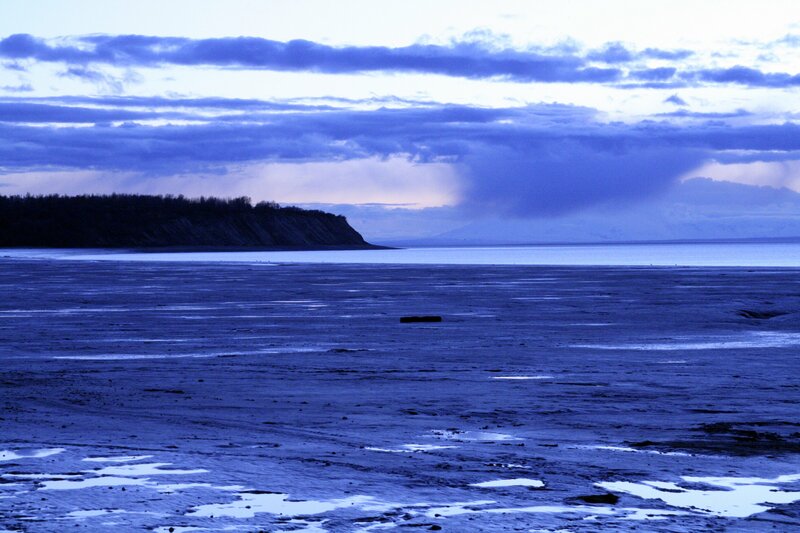 So if you ever visit, please keep off the mudflats, even if they do look silver and lovely in the twilight–promise? Beautiful pictures. Keep this up and I may be on your porch in a few days. I’m low maintenance. The book sounds interesting. I’ll add it to my list. Ha, ha–do you clean bathrooms? If so, come on up. P.S. Please do add Alexie’s book to your list. It’s too good to miss. Hmmm … cleaning bathrooms definitely is not one of my strong points. I’m sure I could come up with something else. Do you want or need a personal chef? That’s the first Sherman Alexie book I read. He is brilliant and this book is a shockingly fun/sad/horrifying/original read. Thanks for visiting, Susanne! Alexie is totally brilliant. He came up here for a reading/talk years ago and I swear, I almost wept, he was that amazing. That book is very good! I enjoyed reading it last year. Great photos!! Thanks, Susan. It’s easy to take great photos up here, the landscape is so incredible. Cheers and have a great week. I’ve wondered about this book, and you’ve really made me want to read it!! !